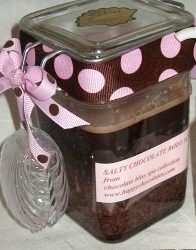 Edible Chocolate Body Scrub | Sass a Craft - Muslim Women are Smart & Crafty Too! Who would have thought you could not only eat chocolate but you can use it as a body scrub? This amazing craft is yummy and helps out with your skin. It works best at the end of a hot bath.